Pit bulls are an unfairly maligned grouping of dogs that have garnered an undeserved reputation for violence. The misunderstanding begins with the very name. Many people believe that the word pit bull refers to just one breed of dog, however there are several different types of pitbulls. In fact, placing every kind of pit bull into one grouping is almost the same as referring to a “hound” as a single breed of dog. The reality is far more nuanced. This article will explain the different kinds of pit bull breeds in order to improve your knowledge of the grouping. It is easy for people to fear things that they do not understand, and hopefully a better grasp of the many different types of pit bulls will help the friendly, loyal dogs from being unfairly criticized. In certain areas of the U.S., such as Florida, the owning of any type of pit bull has been made illegal. This is due in large to the negative press that pit bulls receive. To the uninitiated, there are many kinds of dogs that share the classic physical traits of pit bulls. In fact, there are many breeds that have a broad head and a muscular frame, such as Boxers, American Bulldogs and Old English Bulldogs, which are often incorrectly identified as pit bulls. The American Pit Bull Terrier is a medium-sized, strongly built dog that has a short, smooth coat. They are generally found to be red, black, brown, fawn or solid white in color. On average the dogs weigh 35-65 pounds, with lots of muscle. They are known for their strength and endurance, as well as their intelligence. In years past the dogs were used to hunt prey and drive livestock. 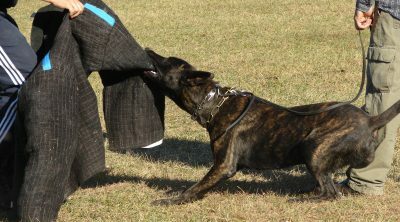 However breeding has now reduced the aggressiveness of the dogs and they are now known as protective family companions. You will sometimes see American Pit Bull Terriers working as search and rescue dogs, or detecting explosives and drugs. The ancestors of this breed were found in Ireland and England. The eyes are usually round or almond-shaped, and the ears are small to medium. Tails are generally quite thick and taper towards the end. The lips of the American Pit Bull Terrier should be slightly saggy and they should have noticeable cheek muscles. If you have other animals in your house, experts recommend careful training of the American Pit Bull Terrier. While the dogs are loyal and protective of humans, they do not react well to the presence of other assertive dogs. Keeping two alpha males together is not a good idea, although American Pit Bull Terriers can live with other non-assertive dogs. Those with other pets such as cats or birds should be aware that the hunting instinct is still strong among American Pit Bull Terriers, and as such extra care should be taken to keep the animals separate. American Pit Bull Terriers need long daily walks to keep them happy and healthy. Regular exercise also helps to prevent boredom and the destructive behavior associated with it. 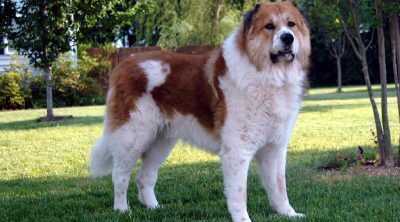 This medium-sized breed has a short coat and usually weighs 65-80 pounds. It also has a very muscular build. The lips of this breed should not be saggy. The dog fighting ancestry can be seen in the extreme strength of the body and jaws, however American Staffordshire Terriers can live alongside other pets. However, it is best not to keep two assertive dogs in the same house. Contrary to popular opinion, the breed is friendly with humans and incredibly loyal to its owner. They are generally good-natured and react well to the presence of strangers. American Staffordshire Terriers are known to be better with children than American Pit Bull Terriers. 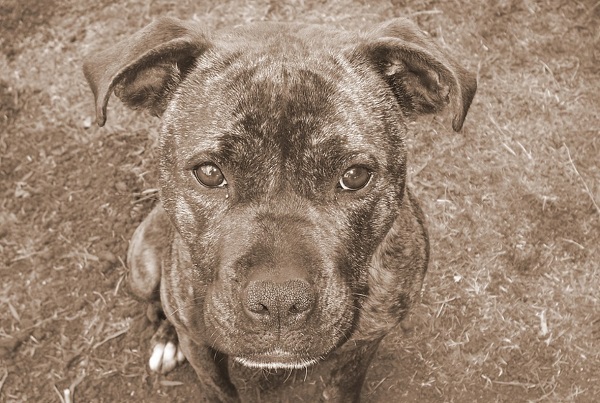 While the name of the breed may lead you to believe that it is originally from the English county of Staffordshire, it was in fact originally found in Birmingham, England in the 19th century, and is sometimes called Amstaff. This is perhaps the most muscular of the pit bull type dogs. 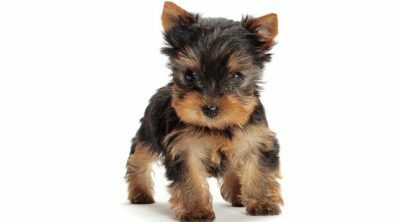 They are medium-sized and have a short coat which sits close to the skin. Staffordshire Bull Terriers weigh 28-38 pounds and are most often seen in white, black and fawn colors. 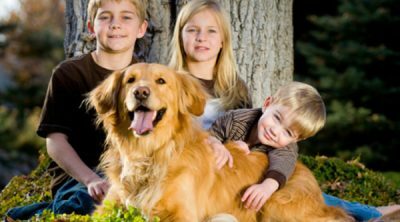 The dogs are known to be affectionate to humans, with plenty of enthusiastic energy which makes it a good companion for children. It is important to train the dog with consistent, firm discipline as they are known to have a stubborn streak. 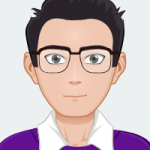 However, if you are a confident dog owner and trainer, you will soon appreciate the loyal and obedient nature of the dog. The Staffordshire Bull Terrier has great stamina and needs to be given regular walks and jogs in order to keep it content. This large-headed dog looks fairly menacing with its large head and rippling muscles. Its compact frame means that the dog is agile while still boasting impressive strength. However, they are known to be very sociable and emotional companions for families. Their protective instincts mean that they are great company for children. It is wise to socialize your pet with other dogs from an early age in order to reduce its aggressive tendencies towards other assertive dogs. Strong owners are needed so that the dog knows who is in charge. 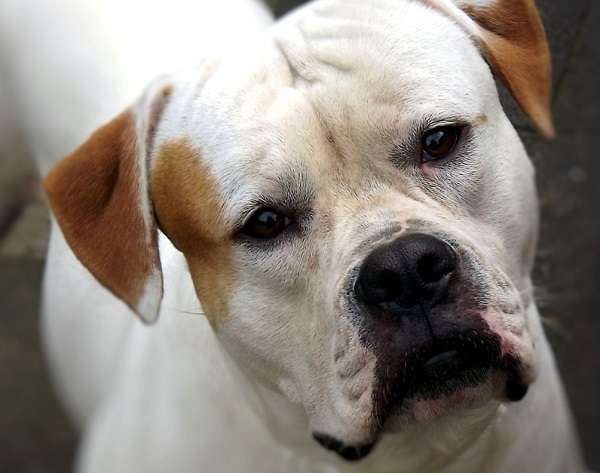 The American Bulldog weighs 60-110 pounds and have predominantly white coats which often have markings in red, brindle and black. The short coats are usually smooth. Strenuous exercise is needed to prevent the dog from becoming bored and destructive. These distinctive looking dogs are often thought to be part of the pit bull grouping. They have a long, oval-shaped head and small eyes which means that they stand out from the crowd. Like the other dogs on this list, the Bull Terrier has a strong muscular build thanks to its ancestry. It was first bred from the Old English Terrier, the Old English Bulldog and the Manchester Terrier. However, this combination meant that the dog performed badly in the blood sports it was originally bred for. 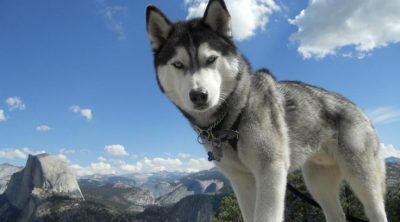 Later on the breed was used as a guard dog. Bull Terriers tend to be primarily white with colored markings. Some dogs do come in other colors like red and fawn. 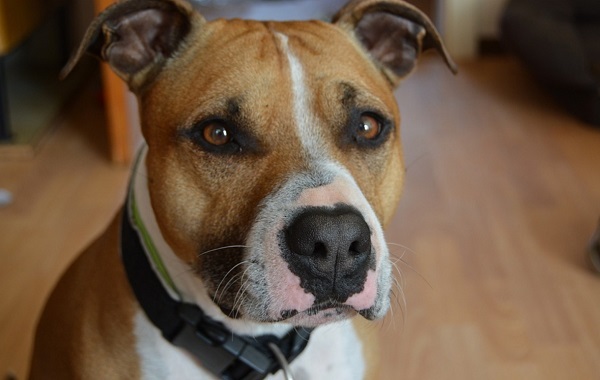 The aggressiveness of the former fighting dog has been reduced thanks to breeding. It is now known as a gentle dog which is good for families, and creates strong bonds with its owners. As such, it is not a good idea to leave the dog by itself for longer than 8 hours at a time. Destructive behavior can be reduced by regular exercise and strong companionship. 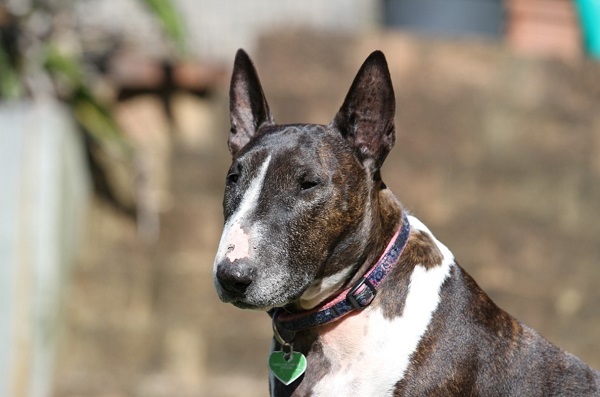 Bull Terriers come in both standard size and miniature, with the latter better suited to smaller homes. One point of note with the Bull Terrier is that it is prone to gain weight quickly if given too much food. Be careful to control portion sizes to stop your dog from getting fat. The breeds listed above are the most common within the pit bull grouping. However, confusion over the naming of breeds has led to a lot of alternative information which only adds to the sense of mystery and danger. As you search for information on pit bull type dogs, it is inevitable that you will see red nose and blue nose dogs mentioned. 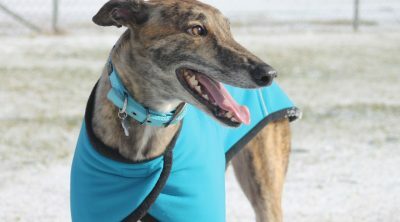 While some websites and breeders will try to promote one color of nose as superior to the other, the fact is that this makes no difference to the dog. Some pit bull type dogs have blue noses due to the level of pigmentation in their nose leather, while others have a different pigmentation and thus a different color of nose leather. Do not be fooled into paying more for a dog with one nose color. In fact, breeders who try to charge more for different colors of nose may be contributing to unhealthy breeding. By limiting themselves to a smaller gene pool, breeders produce litters that are more likely to display poor health and congenital conditions. Another point of interest is the existence of so-called Razor Edge Pit Bulls, Colby Pit Bulls and Gotti Pit Bulls. These are specific bloodlines that some breeders claim will give your pit bull type dog specific characteristics. Razor Edge Pitbulls are bred for their mellow temperament, which makes them better companions than some others. They are sometimes not considered as true pit bull type dogs, but you will hear about them regularly. Colby Pit Bulls come from a famous bloodline of fighting dogs, and tend to be slimmer than other pit bull type breeds. Unfortunately, these dogs are sometimes still raised to fight, sometimes shipped abroad to countries like Mexico where dog fights are legal. Gotti Pit Bulls come from a bloodline famous for its intimidating size. 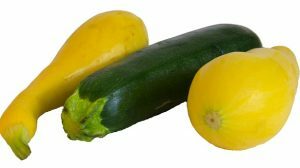 This means that they are popular among people looking for a specific stocky aesthetic. The confusion surrounding the classification and temperament of pit bull type dogs unfortunately makes things far more complicated when it comes to buying and caring for one of these breeds. 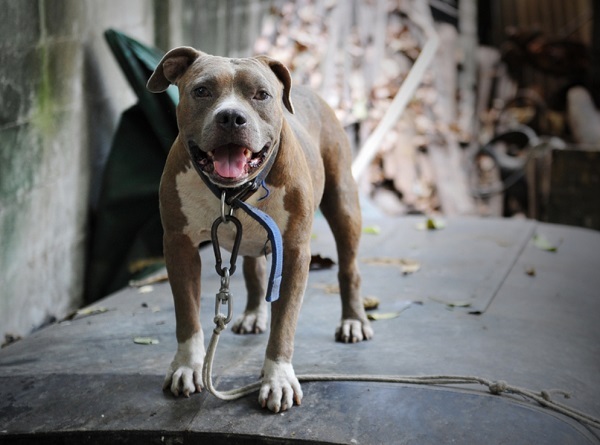 Many people look to cash in on the reputation of pit bulls by selling puppies to criminals or dog fighting rings. However, in conclusion it is not the pit bull type dog that is inherently aggressive, but rather the training and living conditions to which it is subjected that influence its temperament. If you are looking to raise a pit bull, you will be rewarded with a loyal and caring companion if you set strict disciplinary rules and give the dog enough exercise.